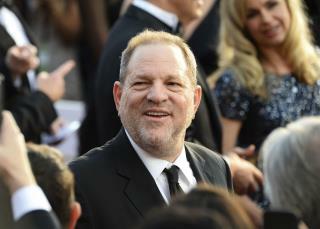 (Newser) – Ronan Farrow says Harvey Weinstein threatened to sue him over his blockbuster piece that the disgraced Hollywood heavyweight raped three women and sexually harassed many others, Variety reports. Speaking to MSNBC's Rachel Maddow on Tuesday, Farrow says he was undeterred by the threat that came during the 10 months he worked on the story. But Farrow, son of Mia Farrow and Woody Allen, added another twist to the explosive saga, saying that NBC News, which originally commissioned the story, dropped it. Asked why, he replies, "You would have to ask NBC and NBC executives about the details." The New Yorker published his article on Tuesday, a few days after a New York Times exposé led to Weinstein's firing. "I will say that over many years, many news organizations have circled this story and faced a great deal of pressure in doing so,” Farrow says. Trump is correct about fake news....covering up for your liberal garbage and not reporting is disgraceful! Ronan Farrow, more likely the son of Mia Farrow and Frank Sinatra (than Woody Allen). Anyway, must've been politics at MSNBC that caused the cancellation of his show. He was excellent. Guess he's too intelligent for corporate garbage cable TV. The only real issue of news worthiness to Americans is the ongoing debate on what constitutes natural and normal interplay between the sexes. The feminist left argues that 'No' means 'No' even if the 'No' comes after the fact and was undecided at the time. The point is one cadre of American social engineers wants to elevate female (disappointment, response to rejection and outrage) to a conflated carte blanche of extemporaneous judgement against the whole male world while a lot of the rest of US see 'dirty hands' on both sides of the boy/girl game we (most of us) all play and in its earliest stages is pretty wild and wooly. It is a failure to put definitions to what constitutes criminal behavior and what is just lust. Perhaps any woman who conceals, tolerates, or invites such acts as society deems 'sexual assault' should herself be guilty of crime (aiding and abetting?) to underscore our seriousness if indeed WE are serious about what is accused as crime in this. We could take a page from fundamentalist religions.